Detector is a mini boss that comes with two turrets. 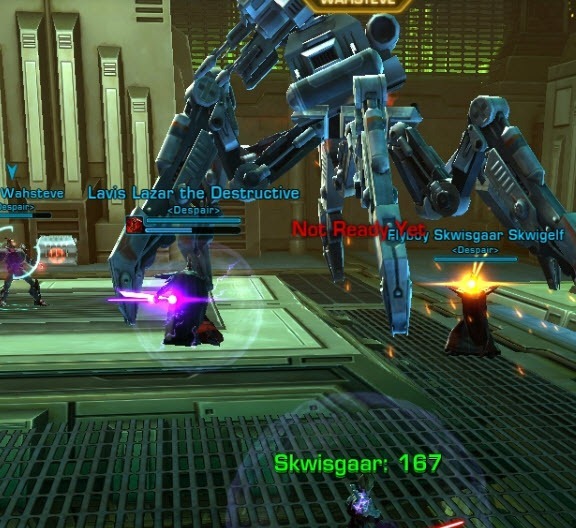 Focus down on the turrets first (they are only normal level mobs) and then rest of the fight is pretty much a tank/spank. 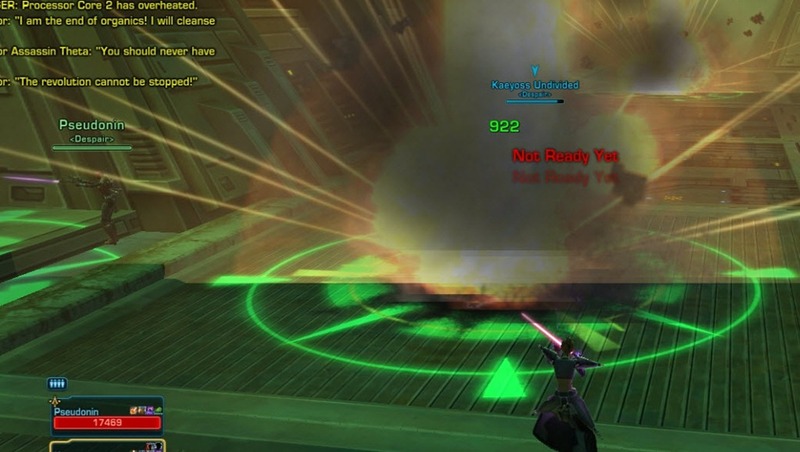 The only other thing you need to watch out is to interrupt the boss’s Reconstruct ability. The trick for this fight is simple, have your DPS and healer stand directly under the console you have to destroy for the fight. 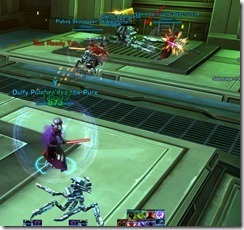 Ideally one DPS and healer stand under one console while another DPS stand under the other console. If you bring melee DPS, just have them run to the console when you see Bulwark casting his AoE. This isn’t ideal in hardmode due to the enrage timer but if your healer can keep you up, melee DPS could stand and take a hit and not worry about running to the consoles until the boss enrages. Bulwark Burst: This is uninterruptable massive AOE that will hit anyone around him that isn’t hiding under the consoles. Melee DPS should run under the consoles when you see him casting this unless your healer can keep you up. 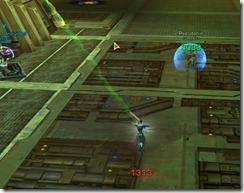 Ranged DPS, as long as they are standing under the consoles, will not have to worry about it. 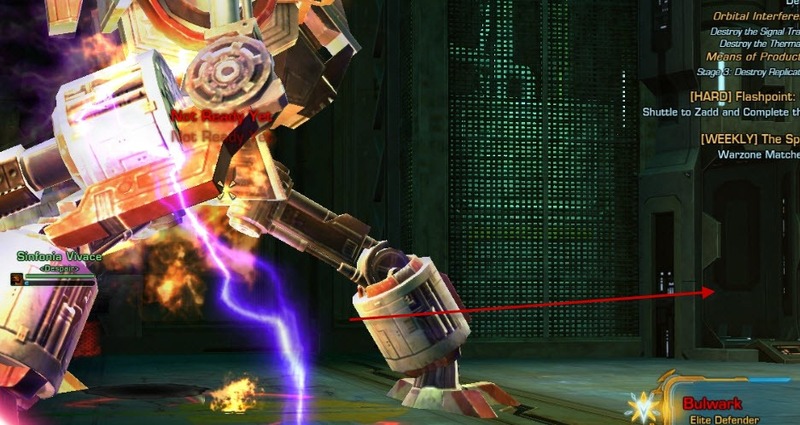 Bulwark Smash: This ability is no longer interruptible and it will stun the tank and do quite a lot of damage to the tank. 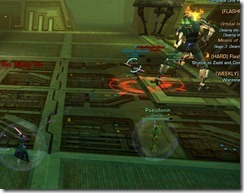 Defensive Protocols: Shortly into the fight, Bulwark will announce – “Defensive Protocols have engaged” and then go into a phase where he stops taking damage and become shrouded in a green aura. In normal mode, he won’t regen his health so this is a good break for your healers to catch up. 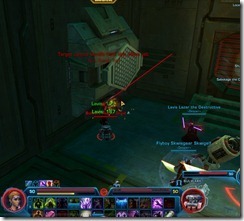 However, in hardmode, due to the enrage timer, you should break him out of the defensive protocol ASAP. The way to do this is via the two consoles you have being standing left and right of him. Just smash the button thingie and it will destroy itself and break Bulwark out of the defensive protocols. 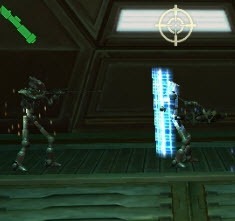 Repair droids: Shortly after you destroy the consoles, two repair droids, one on each side, will spawn and head straight for the console to repair it. 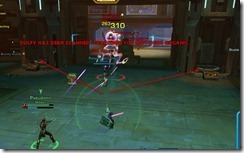 You cannot interrupt their repair ability but they can be CC’ed (Crowd Controlled) and stunned. If they are being CC’ed, they will respawn shortly when the next wave comes. They have about 10 k HP so they are not too diffcult to burn down. 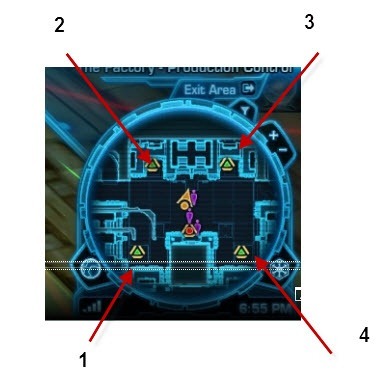 The picture below indicates the location they spawn from. These droids seem to come every 40 seconds. The basic strategy is to rush in, have tank turn Bulwark 180% and then DPS/healers stay under the console if possible (melee will have to stay in and run back to the console if the healer is having diffculty keeping you up). 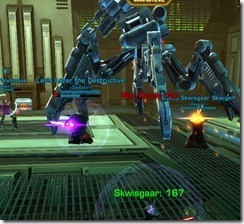 Destroy the consoles when Bulwark switch into “Defensive” Protocol and kill the repair droids whenever they spawn. 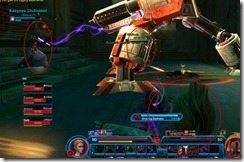 The picture below illustrates the positioning, with tank in the middle and DPS/healer on either side under the consoles. 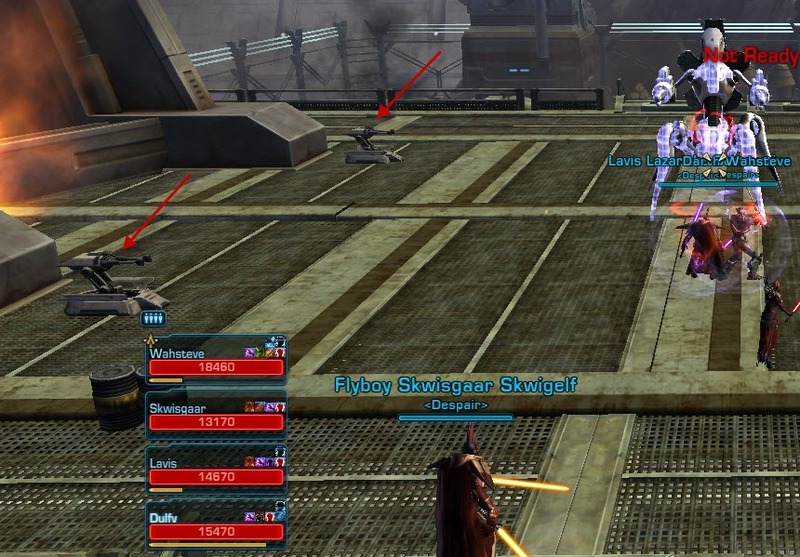 If Bulwark enrages, his AOE will one shot anyone (including the tank) not standing under the consoles. At this point, tank should just run under a console (not the one your healer and DPS are standing, the other DPS should switch consoles if possible so the tank is alone at his console) and taunt it while DPS maximize their “burn” to finish Bulwark off. Bulwark’s normal attacks don’t hurt much but when enraged you cannot survive the AoE. These clones are elite. They do seem to aggro randomly on group members. 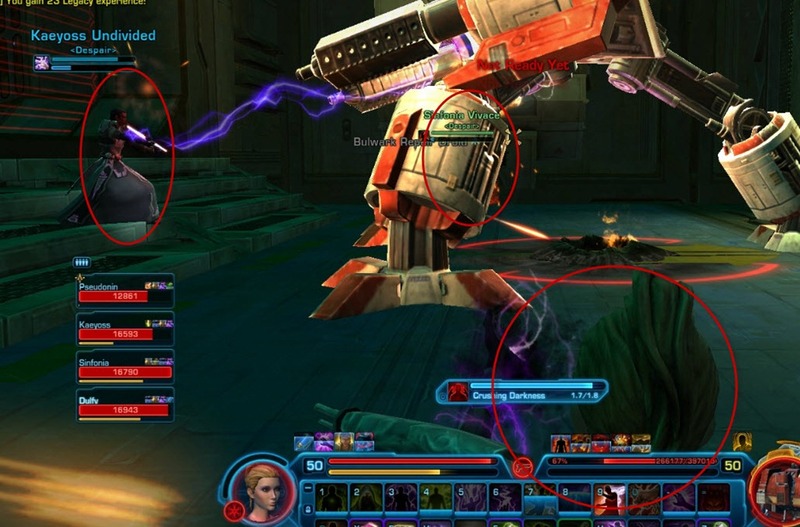 Once you get the clones down to 25%, they each will splint into 4 normal spider droid “babies”, two on each side (red arrow in the below picture points where they spawn). 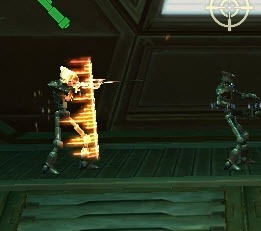 The basic strategy is to burn the “big daddy” droid to 75% so he splits into 3 clones and then take one clone at a time and burn them down to 25%. Finish off the babies it spawns before moving on to the next clone. 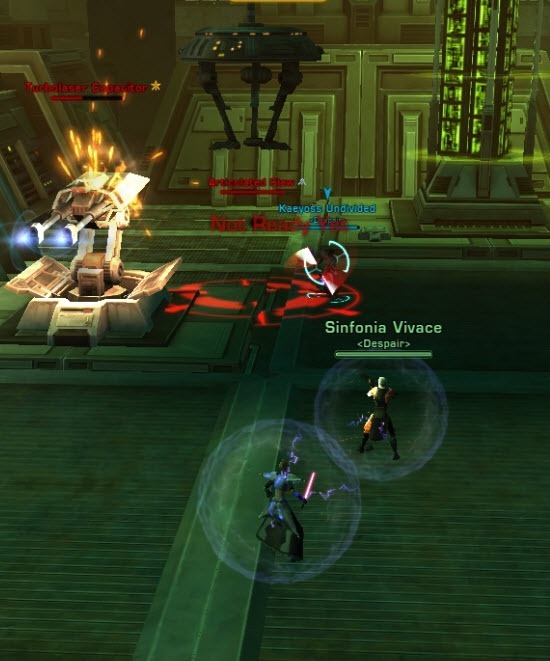 If you are having trouble with enrage, you can either finish off the remaining babies or quickly DPS down the remaining clones as the babies it splits into do not hurt even when enraged. 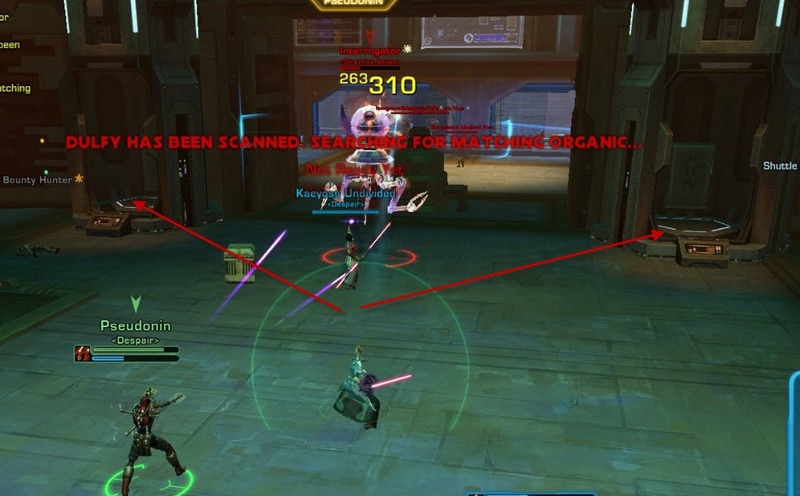 Right after you destroy the two turrets, you will get a message on the screen with the text Danger: Processor Core X Has Overheated. (X can be 1, 2, 3 or 4). At this point, you will need to run to the appropriate processor core and then right click it to destroy it. 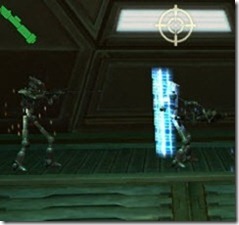 The processor core will be guarded by two small normal turrets. You should destroy the core first and then finish off the two tiny turrets. Failure to destroy the processor core right away will cause them to be “repair” and you have to wait for it to overheat again before you can destroy it. 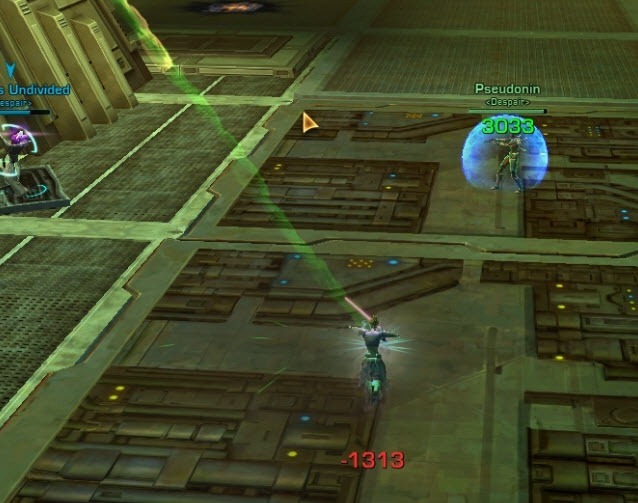 If the beam isn’t enough, Mentor adds more chaos to this fight by placing green circles on the ground that will turn red with incoming missiles. 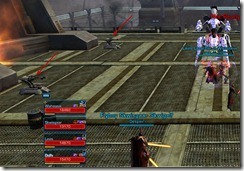 This is the exactly same ground AOE bombardment he has being using before the processor cores are destroyed. 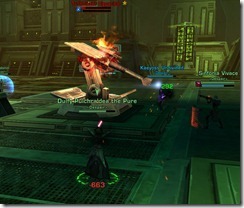 Summary: Turrets –> Core + Guardian –> Core + Turrets –> Core + Guardian –> Core + Mentor. 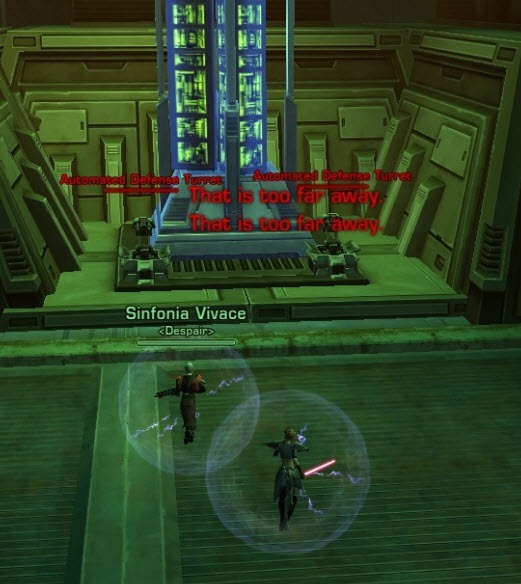 Healing: Quite a lot of movement on this fight, as a sorc healer I used my Rakata medpacs, Static Barrier and Resurgence a lot as I usually don’t have the time to stop and cast Dark Infusion/Innervate. Force speed is definitely helpful here as you can run out of claw/missile circles quickly to stop and heal someone. 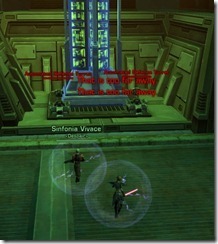 For Bulwark, are you sure his smash is interruptible? Last time I fought him I remember him having the uninterruptible trait. you type enrage instead of engage a couple times, just wanted to point those out, otherwise a very nice guide!! hehe ty for pointing those out! Ran D7 lastnight, extremely buggy. 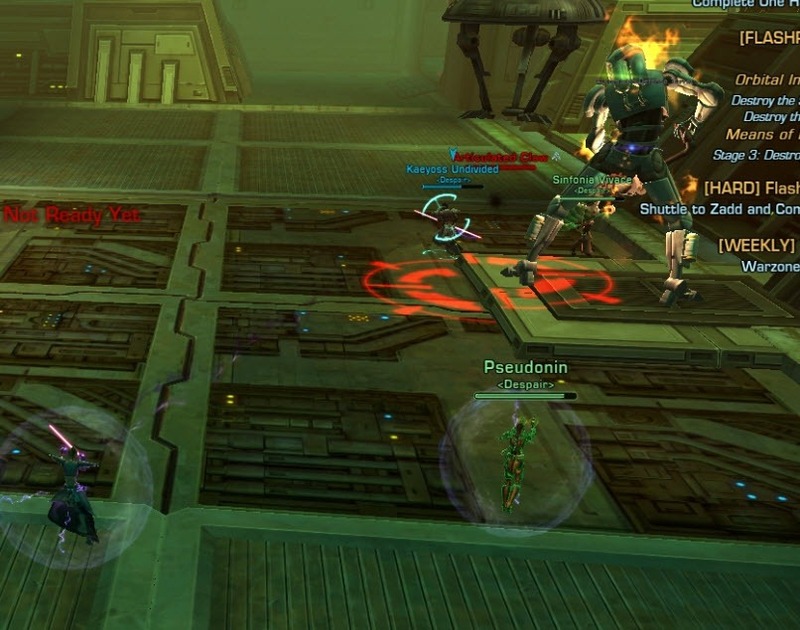 Mentor Assassin driods: burned left and right fairly fast, middle droid only dropped his shield for 1 sec every 20 secs, took long time to kill only be able to get 1-1.5k every 20 secs. Interrogator: would make 2-3 copies every 10 secs or so. We tried him twice reset the instance and tried again and decided to run FE instead. Anyone run into bugs like this? Nice thing to know about the assembler is that you can skip him. Just stay close to the consoles on the right and he won’t see you. 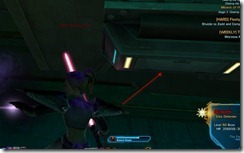 Also, for the assassin droids, you always have to dps them in that order : middle, then left, then right. Once right one is dead, you have to finish the left one, then the middle one. 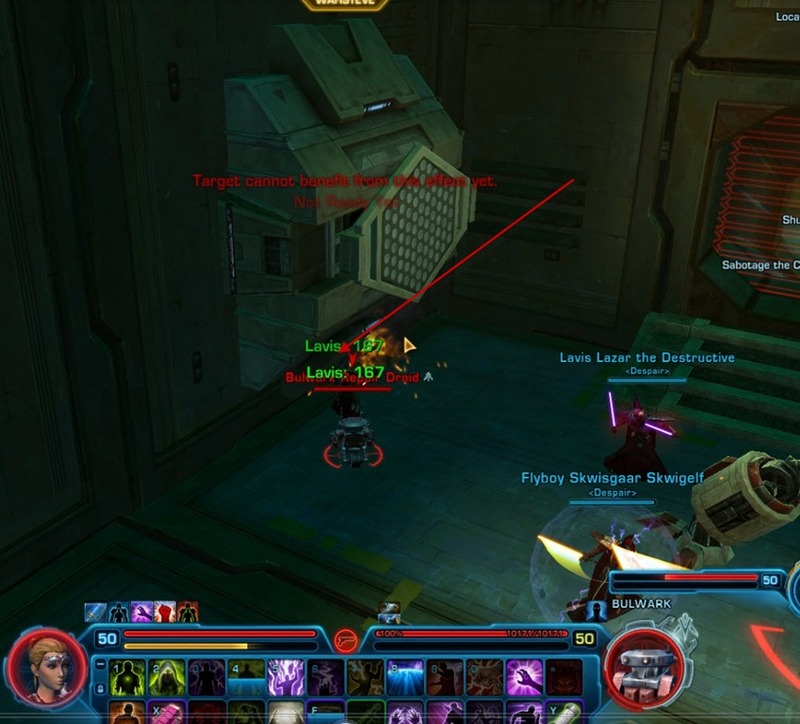 Also, for mentor, if you’ve got someone who can cc droids, you can cc one of the turrets who’ll spawn. 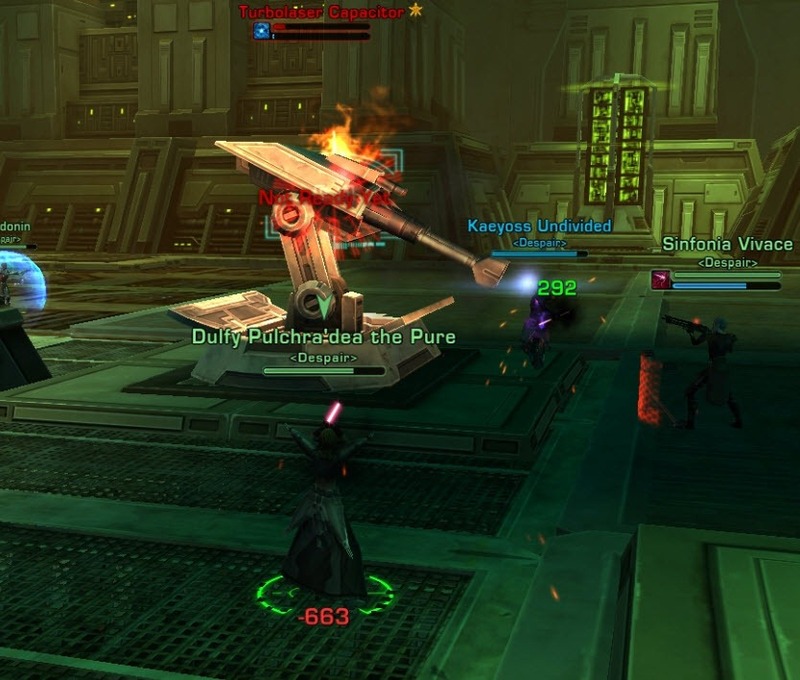 After you’ve killed the first turret, don’t dps the other one immediately, it’ll give some time for the healer to keep up (as the action continues only when you’ve killed the two turrets). We did this last night and our tank said he found that he could Not taunt the claw. He couldn’t target it, nor would any taunts he used work to pull it off. I was the healer and it made it difficult for me to heal the group when the claw got on me. 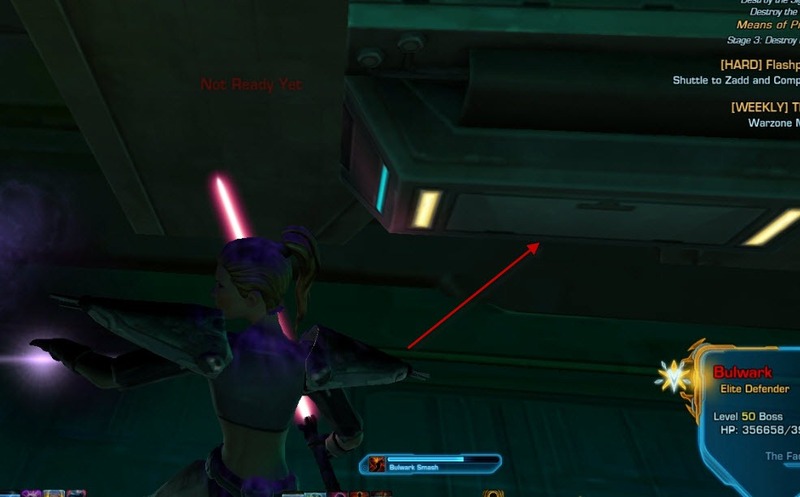 So, has this changed since this and other guides were released or is there a trick to taunting the claw that we were not aware of? Thanks! We just completed this on hard mode and as the tank I could taunt the claw away from the other members of the team.